Aisle, Middle ... Or Video? Emirates President Predicts Windowless Planes Are Coming Tim Clark says he thinks that windows on passenger jets will be replaced with video screens — which are already used in some Emirates first-class suites. Windowless planes would be lighter and faster. 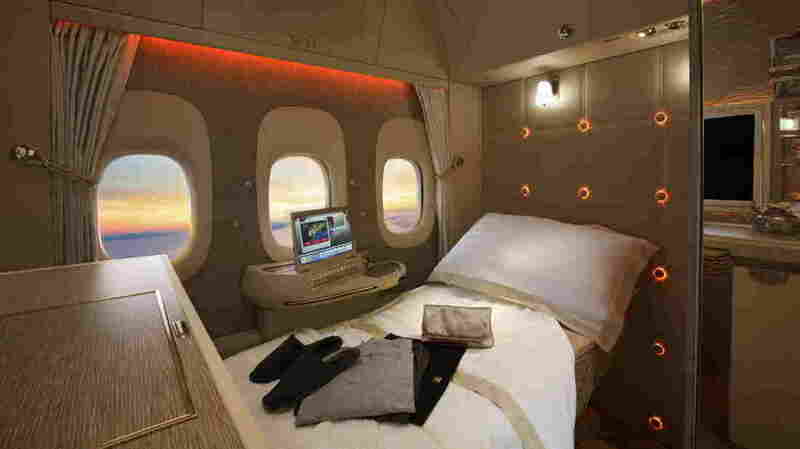 This Emirates first-class suite doesn't have any windows — those are video screens showing camera footage of the outdoors. The president of Emirates says he predicts the technology will be used to build windowless planes — faster, lighter and filled with "virtual" views. The idea has been around for years: In 2014, NPR wrote about a design for a windowless private jet. A British technology and innovation center made the case for windowless commercial planes that same year. But those proposals met with some skepticism, and were seen as futuristic or niche. Now the idea is being promoted by the head of one of the world's largest airlines. In an interview available in-flight on Emirates planes, Clark was asked about the "aircraft of the future" — specifically 15 to 20 years from now. He said he doesn't think large, commercial jets will be flying at supersonic speeds any time soon. But ... he does think big jets will be windowless in the foreseeable future. "I hate to say this to a number of passengers," he said. "On the outside there will appear to be no windows, but on the inside there will be a full display of windows. And we will use fiberoptic camera technology to beam in the images from the outside into those windows — as we have done on the first class suites." Center suites on some new Emirates planes, launched just this winter, have "virtual windows" despite being in the middle of the plane, thanks to those live camera feeds and high-definition screens. An editor at the travel site The Points Guy traveled in one of those suites and praised the experience. Those fancy suites prove that the technology exists to make windowless planes feasible, Clark says. "These images are such high-definition, with a very high pixel count, they are better than with the naked eye," he says. "So I can see the modern aircraft of the future flying faster, higher — windowless." Windows are, "in terms of build and structure and load, quite a problem," he says. He estimates you can reduce a plane's weight in half if you use a composite fuselage that doesn't have to support windows. Windowless aircraft would have fuselages without structural weaknesses, Clark told the BBC this week. "The aircraft are lighter. The aircraft could fly faster. They'll burn far less fuel, and fly higher." The BBC notes that such planes would need approval from regulators — who might be concerned about safety risks in the case of an emergency landing — and might induce extra anxiety in some travelers.